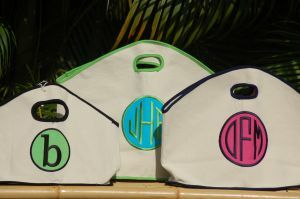 This style of GG bag has an applique stitched directly onto the canvas. This product's applique is a DOT or VARSITY letter. Varsity is also considered a FONT. You must choose a color for the applique (fabric). Next, you must pick a color for the Font and Trim. I suggest you pick the SAME color for the Font and the Trim as seen in the photos.